I am writing to thank you and tell you that I have been using Lavender and Ylang together every night since I first got the oils and I have been sleeping better than I have slept in years. I was ready to go to a sleep center to try to find out why I haven&apos;t slept for years and then went to a home show and found the Aroma Sensations booth. I bought the above oils and I have only had one night in the past 2-1/2 weeks that I couldn&apos;t sleep and for me that is like a miracle. I use it exactly as directed. Also, I started getting a migraine headache when I was at that home show so I went back to the booth and told them I was getting a migraine. They had me sit down and use Rosemary for about 10 minutes and my headache went away and did NOT return. I bought Rosemary also and have used it one other time at the onset of a migraine - and it works. I just wanted to let you know that this is working for me and I am very pleased with the products and the customer service is excellent. Chris Hardy even drove over to my house to bring me one product that they didn&apos;t have at the show. Thanks for being there. 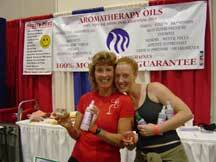 Sincerely, Carol R."
Love your oil scents! 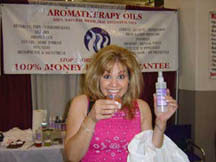 I&apos;m on the road all the time driving in my car and can&apos;t wait to use my new Ylang oil to manage my road rage. Mom loves the Mist. The stress and tension from her surf session left as soon as it was sprayed on her tight spots. What drew me to your exhibit in Del Mar was the Marjoram in solving my snoring problem. Of course, it wasn&apos;t a problem for me - only my wife! But what really caught my attention was the Ylang for concentration. Over the years my concentration ability has slowly decreased and in my decision-making engineering position it was essential that I have that ability. When I opened the Ylang in my office the first thing in the morning I took a few whiffs before settling down to read some documents. After 30 minutes I got up to go out of the office. Reaching to remove my reading glasses I realized I had been reading these documents without my glasses on!! Not only had it improved my concentration, but it had improved my eyesight as well! -- Ed P.
"I love the stuff!! I have them at home and at the office. I just purchased my third jar of Ylang!! I tried the spray and it was wonderful. It worked within seconds!!"